Hi I'm Emmanuel, a second year engineering student studying Aerospace Engineering. I like football, golf and dogs! I've lived in Leicester for over a year now and really enjoyed my time so far. Follow my blogs for an insight into life at Leicester! 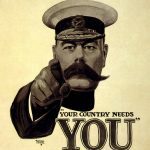 “YOUR COUNTRY NEEDS YOU.” JOIN THE NAVY!